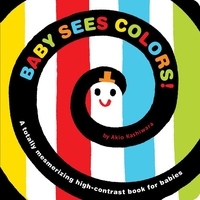 Based on decades of research and refinement, the art in this high-contrast board book is completely mesmerizing for newborns--helping them to focus. Babies as young as six weeks old can appreciate the bold shapes and colors in BABY LOOKS! and will benefit from hearing a parent's voice, and the bonding that naturally occurs when a loving adult reads to a baby. Receptive language skills develop right from the start, as babies soak in everything they hear, and eventually learn to associate particular sounds with familiar people and things. Hundreds of thousands of parents in Japan have already discovered the power of this little book, and now American parents can too!